Because I'm Me boys neckties come pre-tied, making life super easy for the receiver; all they have to do is put the tie on, adjust the neckband, and look like a million bucks. However, sometimes the ties come untied. It happens. Retying them is as simple as basic macrame, with a few adaptions. But don't ask me to explain it verbally (or in print). I've tried. It's not my forte. Lay the tie over the neckband, with narrow end facing down. This is where you decide the length of the necktie, if you want a long necktie leave a short short end, if you want a shorter necktie leave the short end longer. Fold the tie over the band and bring the wide end down towards you and out to the side. Fold the wide end of the tie over and across the short end. Bring the wide end back behind the neckband and lift it upward. The front "knot" will now look like a trapezoid. 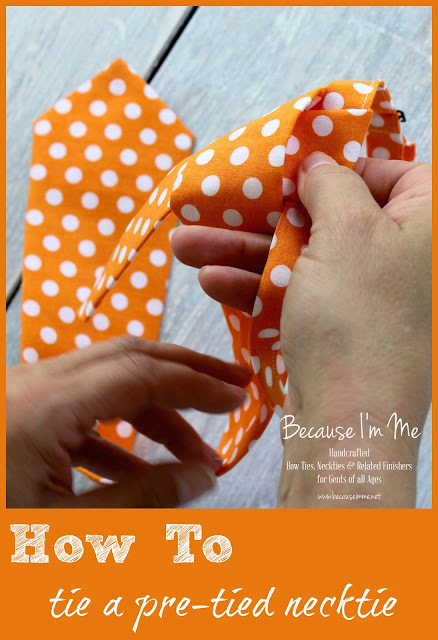 While doing this adjust the neckband do keep it straight, you don't want it twisting or turning into a "squiggly" line, you want it as straight as possible, it just makes it easier in the end. Bring the wide end of the tie back to the front of the tie and thread it through the "knot" you created, again keeping the neckband as straight as possible. Pull gently to bring the band through the knot so it is laying nicely. Pinch both ends of the neckband with your fingers to keep the band straight and adjust/slightly tighten the necktie. Here you can adjust the lengths of both ends a little bit. Do not tighten too much, you want it to be comfortable, not super constricted and thin. Finally, let the neckband slack a little, make sure your narrow end of the tie is in the back and not showing, and give the tie a final adjustment. Not too much tightening, just enough for it to ease into a perfect necktie shape. 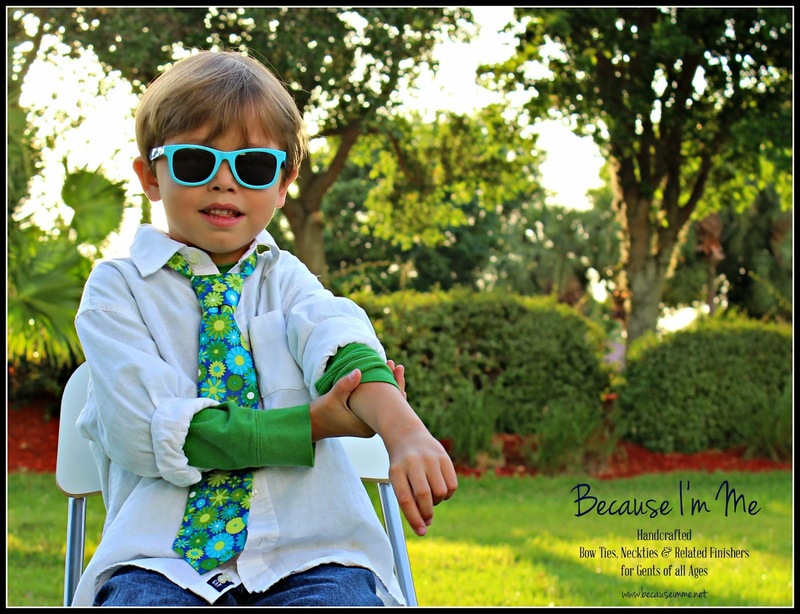 I hope that answers your questions about tying a Because I'm Me Boys necktie. 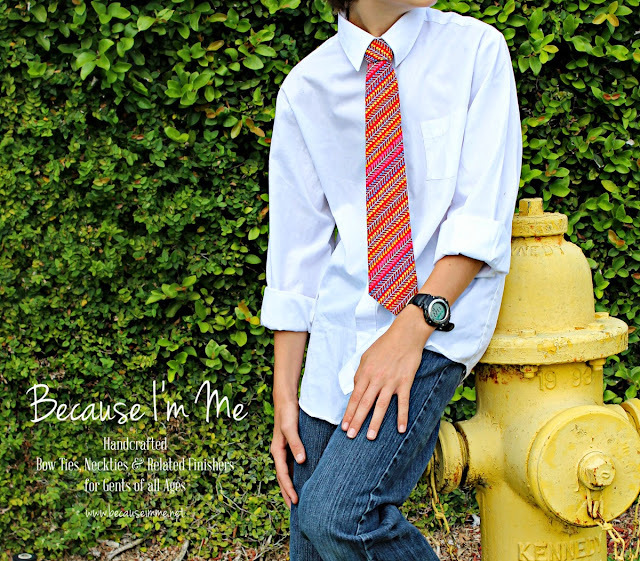 If it doesn't please leave a comment below or e-mail me any questions at becauseimme@gmail.com. I'm hoping to get a video put together to make this even simpler. If you need to retie your tie I suggest pressing it first, not a lot just enough to loosen any wrinkles. I don't recommend machine washing ties, but they can be spot cleaned and air dried.